Five-time Oscar nominee Leonardo DiCaprio will be honored by the Screen Actors Guild Foundation, it was announced Thursday. The actor, who could be in the thick of the Oscar conversation later this year for his largely silent performance in Alejandro González Iñárritu’s “The Revenant,” will receive the organization’s “Actors Inspiration Award” at a Nov. 5 event in Los Angeles. 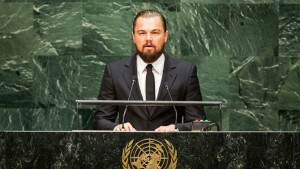 The honor is meant to highlight his career achievements on the screen (he has eight SAG nominations to go along with his five Oscar nods), but also recognizes his philanthropic work as chairman of the Leonardo DiCaprio Foundation, aimed at protecting biodiversity and conserving the world’s oceans and forests and bringing an end to climate change. DiCaprio picked up Academy Award nominations for his work in “What’s Eating Gilbert Grape,” “The Aviator,” “Blood Diamond” and “The Wolf of Wall Street.” He was also nominated as producer of “The Wolf of Wall Street” in the best picture category.